Two improbable moments, seemingly straight from a Hollywood script … and both came in the same game. The two moments were buzzer-beating three-point shots from seventh-grade Clear Creek Middle School Lady Cats (and sisters) Emma and Elly Callihan, which gave CCMS a 32-31 victory over the Fannin County Middle School Lady Rebels and the 2015-16 North Georgia Mountain League championship yesterday at Dawson County Middle School. 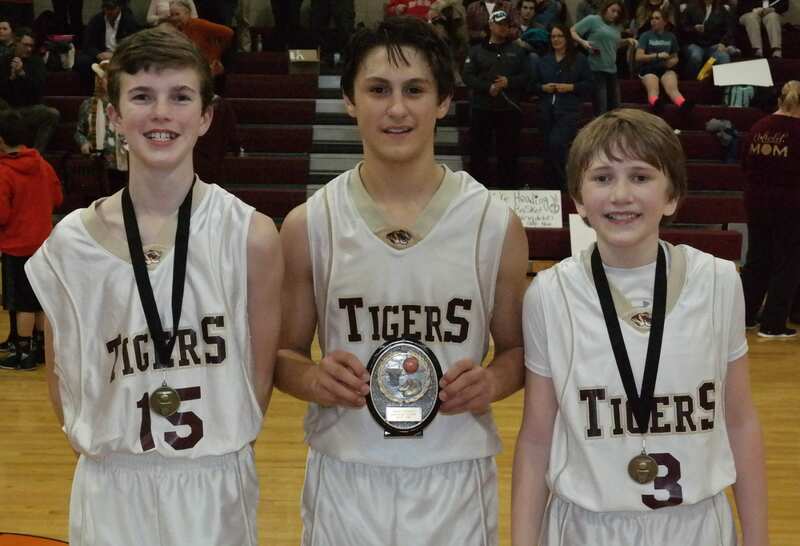 Meanwhile, the hosting, undefeated Dawson County Middle School Tigers capped off a 10-0 season by besting the CCMS Bobcats 45-31 to win the seventh-grade boys championship. 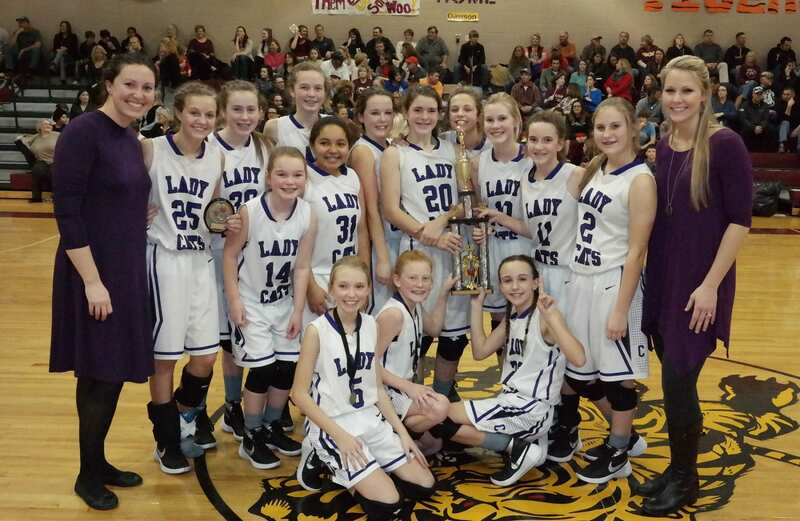 The seventh-grade girls game built to its dramatic conclusion from the outset. Fannin seized an early first-quarter lead, before a Natalie Thomas three-point play put the Lady Cats in a 5-5 deadlock with the Lady Rebels. The first period went on to end in a 7-7 stalemate. 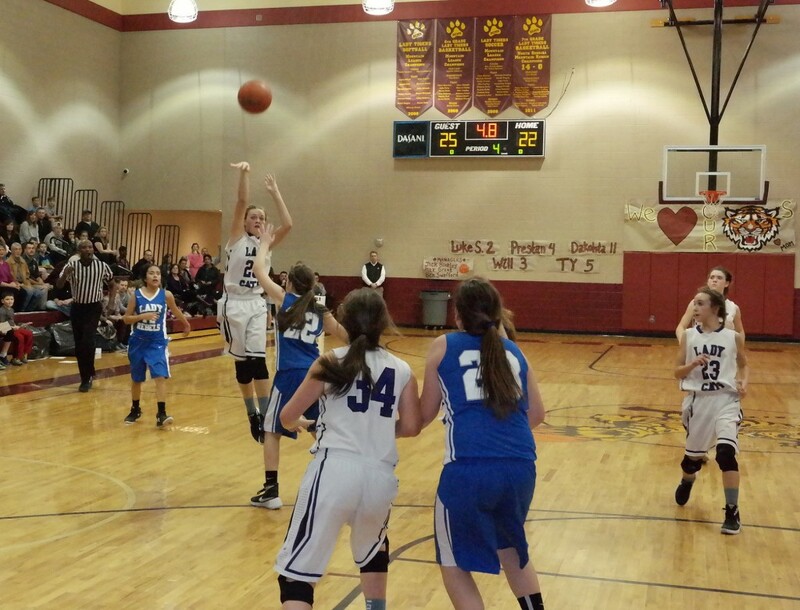 FCMS tied the game 13-13 just before halftime, before Emma Callihan gave CCMS a 15-13 halftime lead with a two-point bucket at the buzzer. Almost like the calm before the storm, the third quarter proved to be difficult for both Fannin and Clear Creek. MacKenzie Johnson provided the lone Lady Rebels basket, while Emma Deyton scored off a steal to keep the Lady Cats lead at 17-15 by the end of the third. The game continued its back-and-forth theme in the fourth quarter. 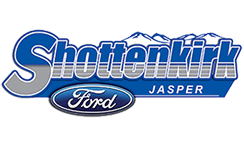 A three-point play from Olivia Sisson put Fannin ahead 21-19 with 1:08 left in regulation. 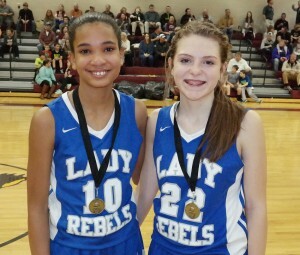 The Lady Rebels added two more baskets to open up a late 25-22 advantage and were poised to win the championship. 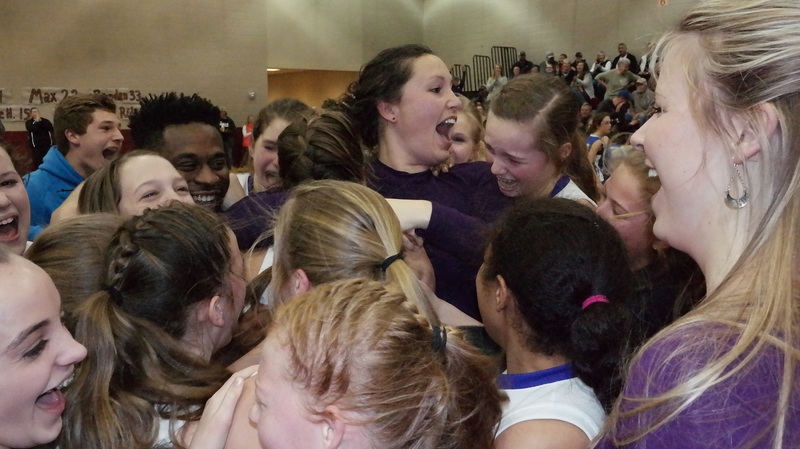 However, Emma Callihan had other plans for the Lady Cats, as she caught an in-bound pass with less than 10 seconds left in the game, drove down the court and launched a three-point shot that tied the game 25-25 and forced an overtime. Fannin refused to go down without a fight. Buckets from Paige Foresman and Abby Ledford, mixed with two free throws from Johnson, put the Lady Rebels out front 32-29. But although Emma Callihan went down in overtime with a sprained ankle, her younger sibling Elly stepped up for the crescendo. The situation mirrored that of the end of regulation, with a different Callihan in control of the ball. Elly trotted two steps past half-court and propelled the basketball from well beyond the three-point line. The heave shockingly swished through the net as the buzzer sounded, sending the Clear Creek faithful into a frenzy and giving the Lady Cats the 32-31 win and the 2015-16 North Georgia Mountain League seventh-grade girls championship. 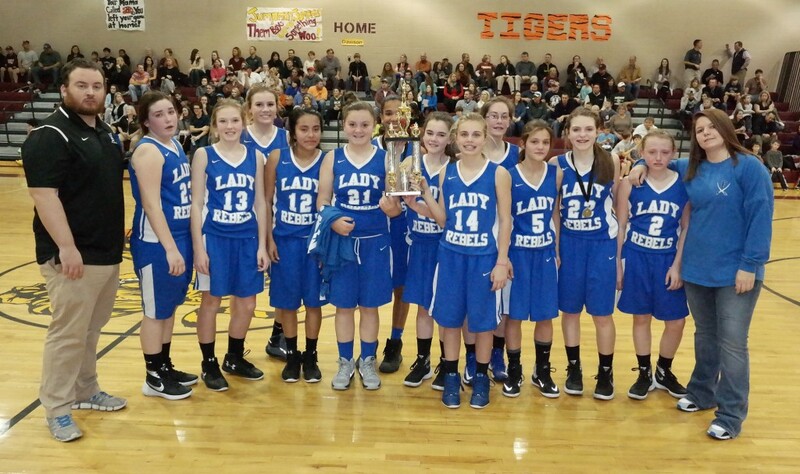 The seventh-grade Lady Rebels finish the year with an 11-3 record, while the Lady Cats completed the campaign with a 12-2 mark. 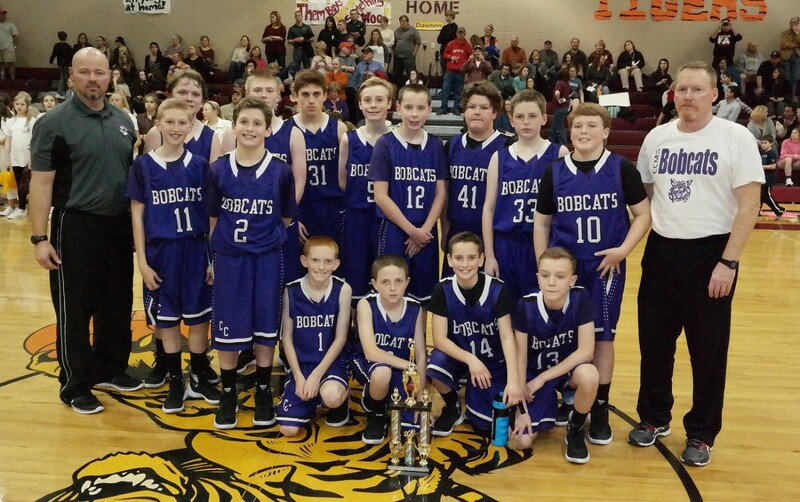 In the seventh-grade boys title game, the Tigers built early momentum to stay one pounce ahead of the Bobcats throughout the first half. A strong offensive and defensive first quarter from Dakota Sonnidson (nine points, three rebounds, one steal) helped give Dawson an 11-5 lead by the end of the period. A combined nine second-quarter boards for the Bobcats gave Clear Creek the chance to cut the lead down to 17-14 by halftime. 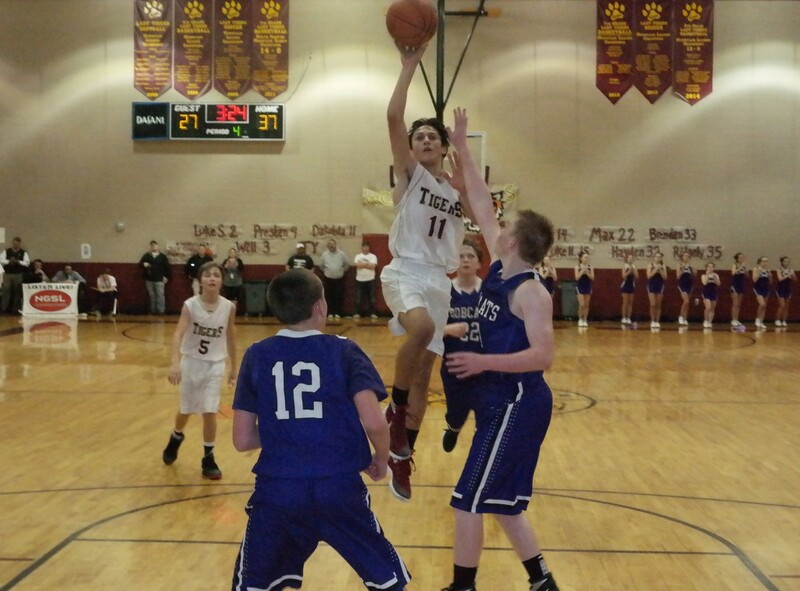 Dawson responded by outscoring CCMS 18-8 in the third quarter, opening up a 35-22 lead in the process. 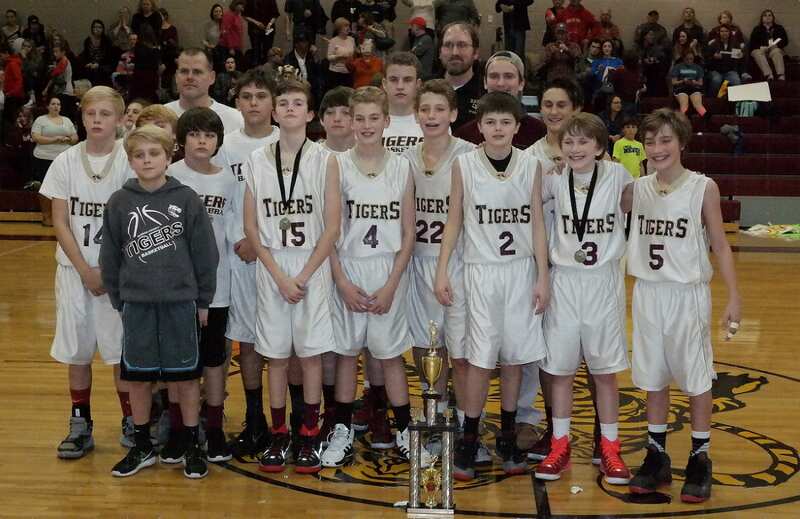 With reserves playing the closing minutes of the title game, the Tigers went on to claim the 45-31 victory and the seventh-grade boys championship. 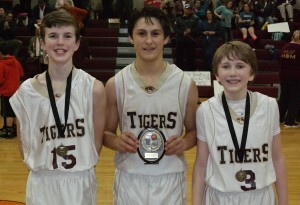 The seventh-grade Tigers finish the year with an unblemished 10-0 record, while the Bobcats wrap up the season at 8-7. 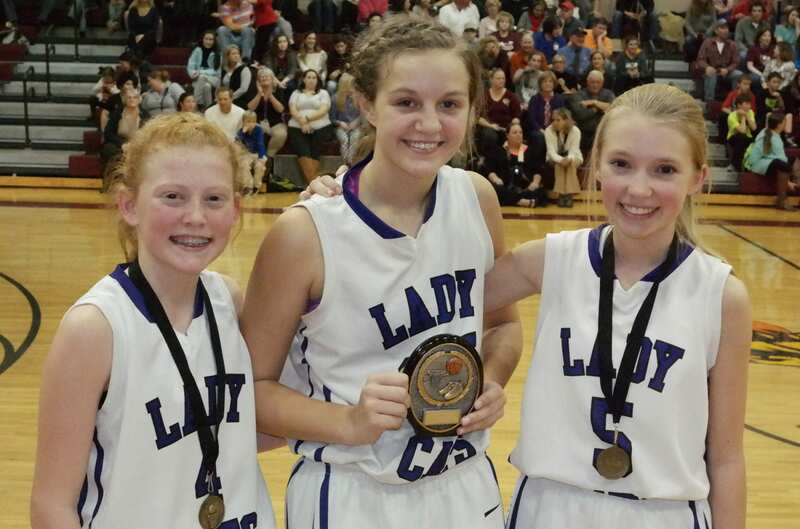 Emma Callihan: 17 points, four rebounds, two steals, 5/9 on free throws. Natalie Thomas: Nine points, three rebounds, 1/3 on free throws. Elly Callihan: Three points, five rebounds, 0/4 on free throws. Emma Deyton: Three points, 11 rebounds, two steals, one block, 1/3 on free throws. Hope Colwell: Three rebounds, two steals, one block. Reagan Boling: Two rebounds, one steal. Abby Ledford: 10 points, two rebounds, two steals, 2/8 on free throws. MacKenzie Johnson: Eight points, three rebounds, two steals, 2/6 on free throws. Olivia Sisson: Seven points, four rebounds, three steals, 1/3 on free throws. Prisilia Bautista: Four points, two rebounds, 0/6 on free throws. Paige Foresman: Two points, five rebounds. Becca Ledford: One rebound, one steal. 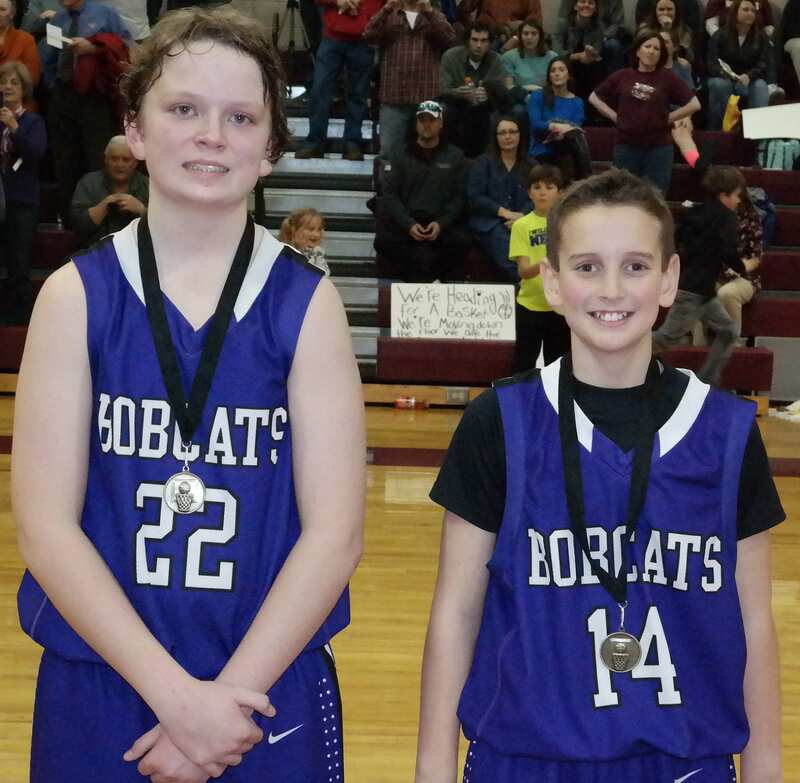 Dakota Sonnidson: 23 points, five rebounds, three steals, one block, 3/8 on free throws. Will Howard: Eight points, two rebounds, one steal, 5/6 on free throws. Ty Whitmire: Seven points, three steals, two rebounds. Max Tierney: Seven points, four steals, two rebounds, 0/2 on free throws. Brendan Swafford: Five rebounds, three steals, one block, 0/2 on free throws. Braden Jenkins: 14 points, two rebounds, one steal, 1/3 on free throws. Cameron Weaver: Eight points, six rebounds, one steal. Lewis Mulkey: Three points, two rebounds, one steal, one block, 0/2 on free throws. Brady Sanford: Two points, three rebounds, one steal. Isaiah Hopper: Two points, seven rebounds, one steal. Ethan Banks: Two points, one rebound.